Subject to Change : Regan Gentry. 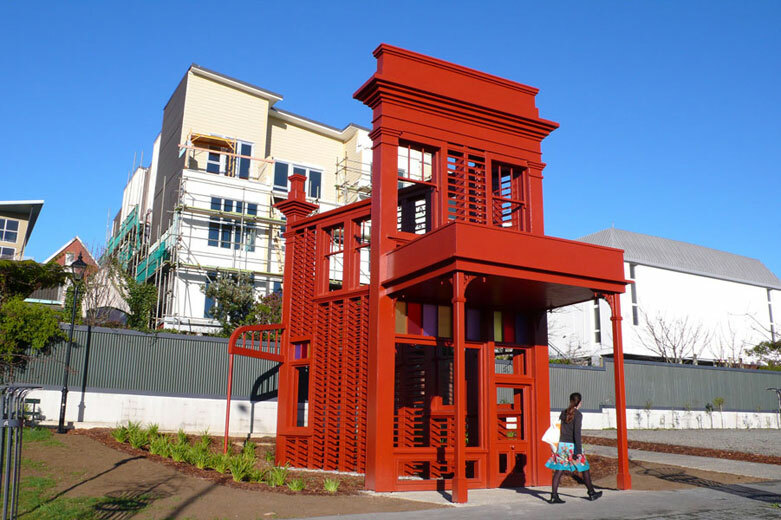 A re-designed free-standing facade of a local historic building. Steel, wood, concrete, paint. Permanent work. 8 x 11.5 x 4m. SH1, Karo Drive, Wellington. 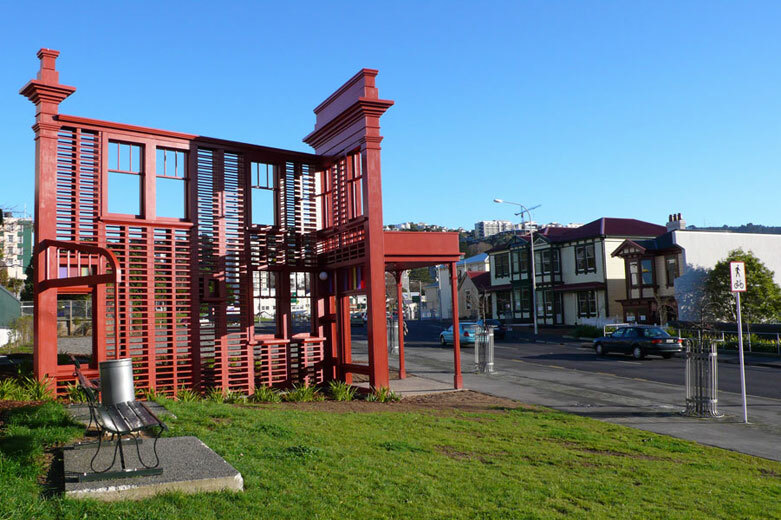 Commissioned by Transit NZ, facilitated by Wellington Sculpture Trust. 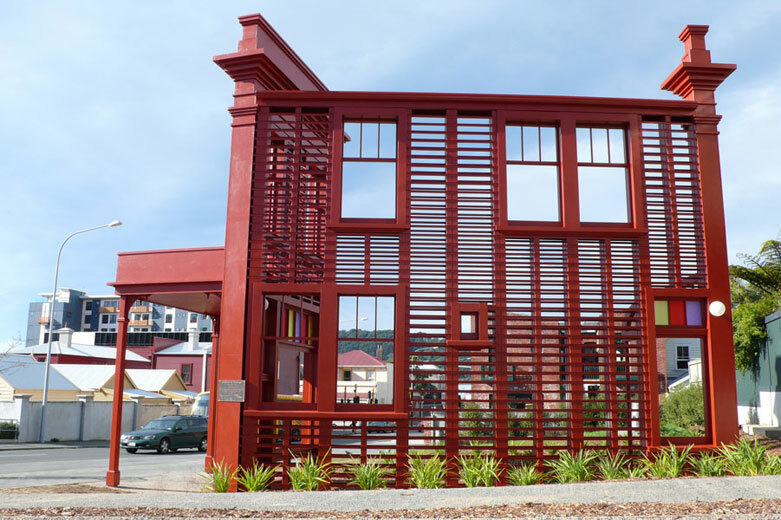 Subject to Change is a replica of two walls of a heritage-style building (façade and side wall). It looks like a slice of building left behind by the developers, cut away and tenuously existing on the edge of the new motorway. 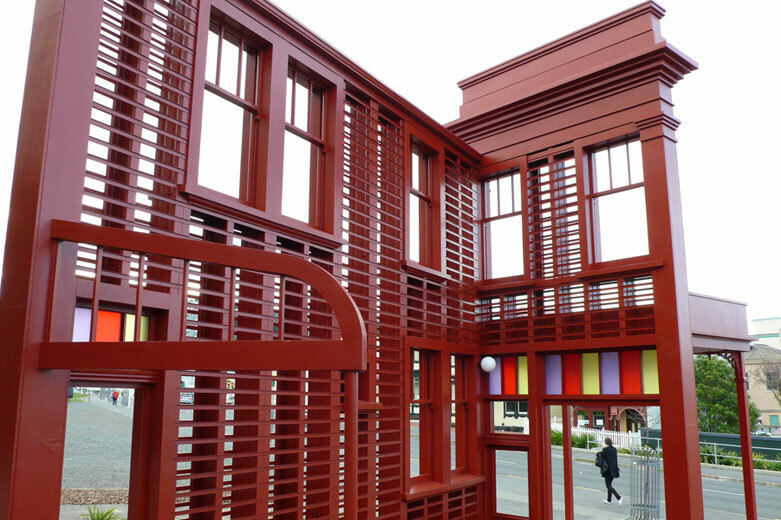 Subject to Change is a work that draws attention to the architecture of a special part of central Wellington, New Zealand, which has recently experienced the SH1 motorway extension. This major infrastructural development has been on the drawing board since the 1960’s. Because this area has been ‘subject to change’, property investment and development has affected it less than in surrounding areas. The buildings of upper Cuba St became a kind of time capsule. Cheap rent attracted ‘creative’ communities who made homes in the buildings and established connections with the place. The motorway development has meant a number of these buildings have been removed, relocated and/or renovated, to fit with the new layout and image of the area. The buildings have been adjusted to fit the new environment. Subject to Change emphasises the ‘built to fit’ nature of the new upper Cuba street environment. The appearance of the work derives from the architecture in its immediate vicinity. It mimics components and colour schemes of these buildings to integrate it within the historical and contemporary context. The colour scheme of Subject to Change is oxide-red, again referring directly to the local historic buildings. 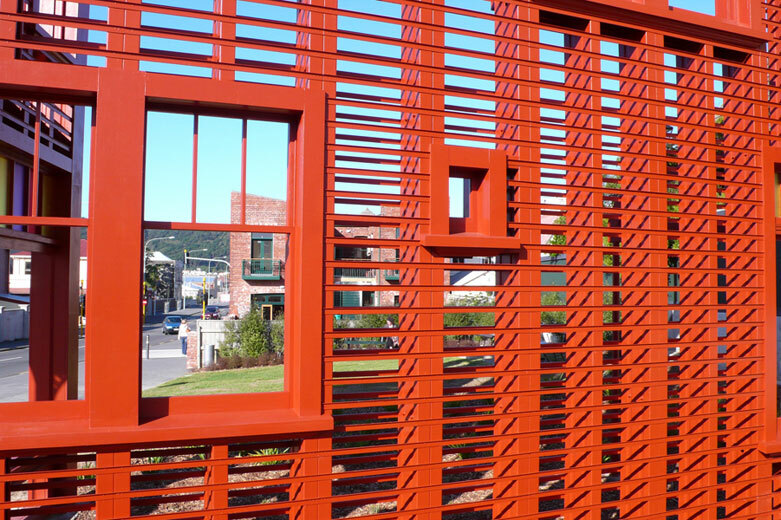 Although the sculpture is made primarily of steel, Subject to Change sports the appearance of weather boards, as it is the wooden heritage buildings which have undergone most of the recent changes and relocations.